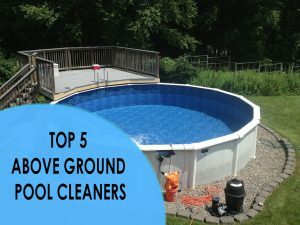 We have put together a list of the best above ground pool cleaners available today. Above ground pool cleaners offer a slightly different feature set than inground pool cleaners, and are usually powered by the pool’s current filtration/pump system. Many above ground pools do not have stairs or slopes that only pool cleaners designed for inground pools can handle. This also makes these pool cleaners a lot cheaper than the models designed to clean inground pools. Check out our above ground pool cleaner reviews below! Do not be fooled by the cute design of the Aquabug by Hayward. 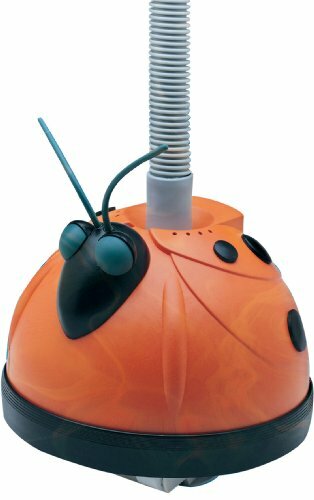 This ladybug-looking pool cleaner is great for above ground pools and will impress even the most skeptical individuals. The Aquabug hooks up to your pool’s existing filtration system in about ten minutes without the need for tools or complicated instructions. The Aquabug is one of the most reliable and cost-effective cleaning solutions for your above ground pool cleaning needs. This unit features a turbine and gearing system that allows for a constant balanced flow of water, making operation quiet and the movement of the cleaner through the pool silky smooth. There is a bumper ring that keeps the Aquabug from getting stuck on walls and reduces the overall friction while the cleaner is roaming your pool floors. The included hose is 32 feet, so make sure your pool is not larger than the coverage area of this cleaner. There have been some comments about the cleaner getting stuck behind the pool ladders, which can easily be fixed by installing a small bumper behind the ladder to keep the cleaner from getting wedged behind. Backed by a one year warranty, you can’t go wrong with the price point of the Aquabug. If ladybugs are not your style, check out the Pentair Kreepy Krauly Lil Shark above ground pool cleaner. 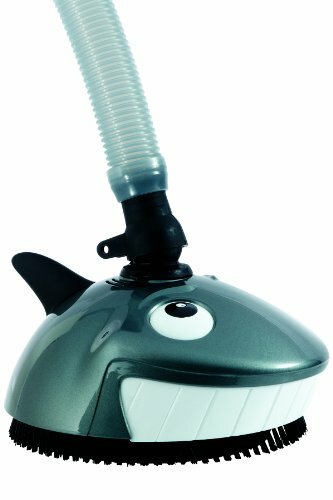 The Lil Shark features dual band nylon bristles that cut away at algae and buildup on your pool floors that other pool cleaners may leave behind. Install process is very simple: remove from box, attach the hose to your pool’s existing filtration system, and place it in the pool. The design is very low maintenance with only one moving part. This will keep your maintenance costs down and increase the lifetime of your pool cleaner. The unit comes with a 30 inch hose, so make sure your pool is within the coverage area of the included hose. Pentair Lil Shark is backed by a one year warranty for defects or workmanship. The stylish design of this cleaner will keep the kids entertained and is a fun conversation starter for when your friends come over to admire your crystal clear pool. If you are looking to cut back on the pool cleaning tasks and start enjoying your pool a little more, then this is the perfect fit for you. Next up is the Polaris Vac-Sweep 65 pressure side automatic above ground pool cleaner. 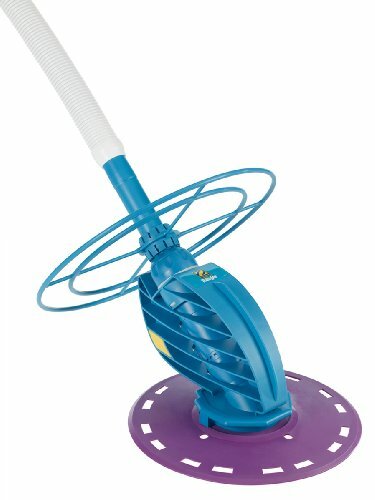 This product features a unique cleaning method by blowing water against the pool sides to loosen up dirt and debris, and then sweeping it up with its vacuum collecting. The Vac-Sweep 65 is easily installed in minutes and is designed to work in almost all above ground pools, up to five feet deep. This pool cleaner has its own debris bag that will catch things like leaves, small twigs and pebbles, keeping your skimmer free from the extra debris most suction side cleaners add. The Vac-Sweep 65 above ground pool cleaner has cleaning cycles that will last up to three hours to clean most pools with average debris. If your pool is extremely dirty, you may have to run the cleaner through an extra cycle to achieve the desired results. There is an included 24 foot floating hose that allows the Vac-Sweep 65 to clean above ground pools up to 24 feet in diameter. Vac-Sweep is also capable of cleaning pools with uneven floors or can tackle a pool that has wrinkles in the lining. 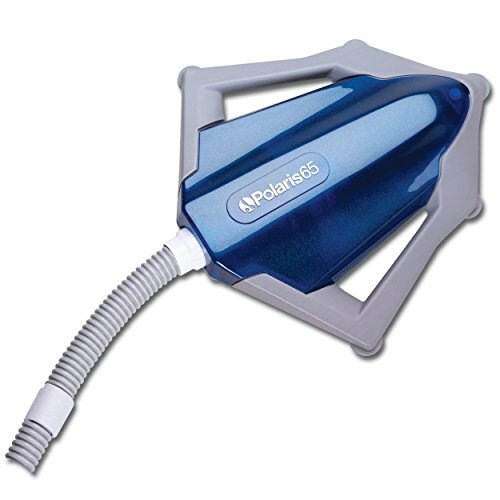 Polaris makes some of the best pool cleaning equipment available and you can always expect top notch performance from their products. 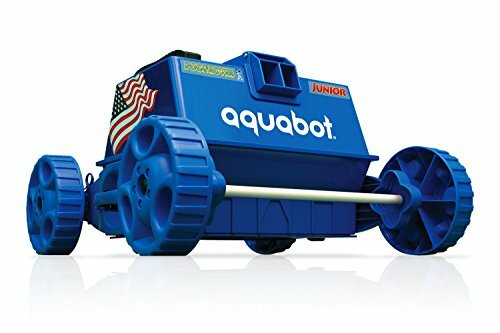 If you are looking for a fully-automated solution to cleaning your above ground pool, check out the Pool Rover Junior by Aquabot. This automatic above ground pool cleaner will clean any round, oval or rectangular flat bottom above ground pool in an hour or less. It doesn’t use hoses or need to be hooked up to your existing filtration system. The Pool Rover Jr. includes a 40 foot floating cable, allowing the cleaner to cover almost any above ground pool size out there. There is an included two micron removable filtration bag and power supply to get you up and running right out of the box, a true plug and play device. Aquabot above ground pool cleaners are designed to clean residential above ground pools filtering 70 gallons of water per minute through its two micron filtration bag. This keeps your pool water free of dirt and debris on auto pilot. There is also an automatic two hour shutoff to help conserve power and keep your energy consumption costs as low as possible. The cleaner’s motor is backed by a one year manufacture warranty in case of any defects or faulty parts. Over all, this is a great choice for above ground pool owners to keep their maintenance costs down, and to enjoy their clean pool instead of worrying about cleaning it the old fashioned way. 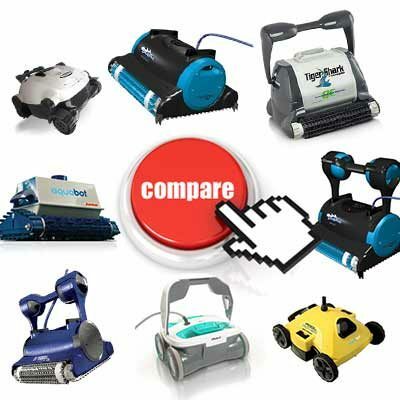 The Zodiac Ranger is the last on our top five list for above ground pool cleaner reviews. There is only one moving part on this device, which minimizes the need for expensive or complex repairs. The deflector wheel keeps the Ranger from getting stuck on objects like ladders, steps and pool corners. The Ranger above ground pool cleaners come assembled and ready to go so, there is no complicated setup process. The included 32 foot hose will clean pools up six feet deep and about 30 feet in diameter. Zodiac makes some of the most advanced above ground pool cleaners on the market. This model includes the Flowkeeper Valve™ that automatically adjusts the flow control valve. This regulates water flow, ensuring the most effective cleaning cycle possible. With only one moving part, there is very little noise generated from this pool cleaner. Installation is extremely easy, and the pool cleaner is backed by a full one year manufacture, and wear and tear warranty. If you still have questions about the best above ground pool cleaner for your specific needs, feel free to drop us a line on our contact us page.